Of all the disruptive platforms and technologies discussed at the Forum’s Annual Meeting of the New Champions this year, one in particular continues to attract a great deal of buzz: blockchain . Some experts suggest that the blockchain, which is effectively the machine behind the cyber currency bitcoin, could completely transform the way we pay for goods and services or exchange information. For those of us in the real estate business, that has potentially game-changing implications. In essence, the blockchain allows a continuously updated database to be distributed across a network of computers. Its distributed nature ensures the integrity of that database, removing the need for intermediaries and making the information contained within it completely secure. The net effect is to bring a new level of transparency to financial transactions. In terms of the real estate industry, the technology has the potential to allow countries around the world to develop a comprehensive real-time database of the use and ownership of buildings. Trials of this are already being conducted in Sweden, Ghana and Georgia. This could be transformational because transparency in real estate markets has a profound impact on both economic development and the quality of life of citizens. For example, it confirms ownership and checks on the enforcement of building regulations which, in the case of an earthquake or other natural disaster, could be a life and death issue. Transparency also provides increased protection for individuals’ property ownership rights. On a broader, international scale there is a clear link between transparency and the attractiveness of a country’s property market to foreign investment. JLL recently published its biennial Global Real Estate Transparency Index (GRETI), tracking transparency in real estate markets. 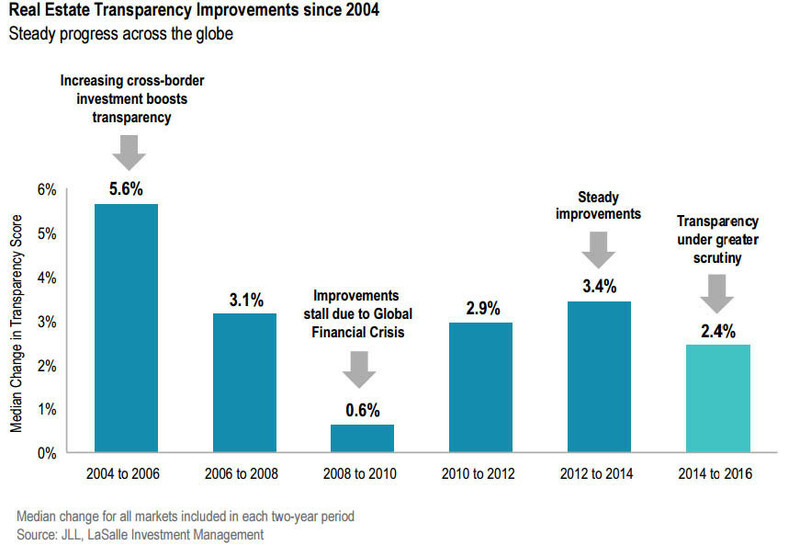 Strikingly, the top 10 most transparent markets attracted 75% of global investment in commercial real estate. With capital allocations to real estate growing (JLL forecasts growth from $700 billion to over $1 trillion within a decade), pressure is growing for real estate to have similar transparency as other international asset classes. The impact has been most marked in Asia Pacific, the region that has made the greatest strides in real estate transparency, according to our index. Japan, for example, has moved in recent years from having a “semi-transparent” to a “transparent” real estate sector. This is largely due to multinational companies driving the amount of market data available to investors. Meanwhile, a recent initiative in Taiwan will result in the registering of all individual sales transactions, including the price. China’s largest property markets are following suit, responding to market pressures. The real estate industry is making great efforts to track the markets of cities like Shanghai and Beijing. 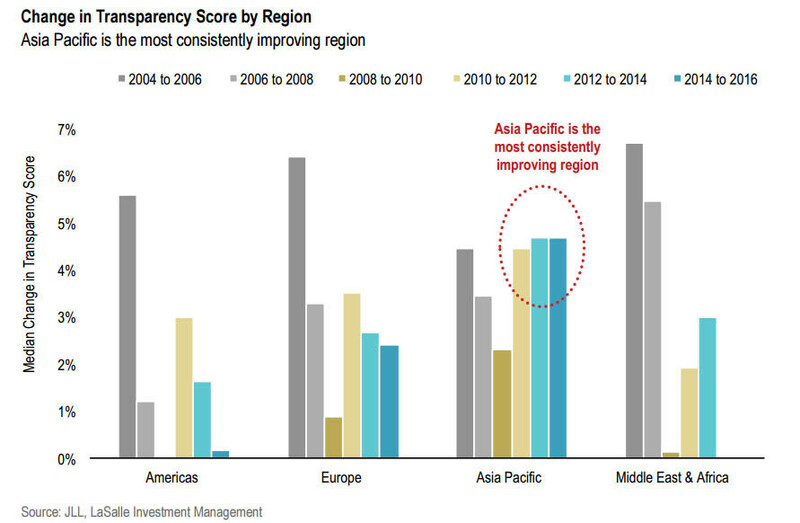 As investment grows in Asian property, so does transparency. This trend is aided by technology, and not just through the promise of the blockchain. Existing digital technology has allowed the compilation and distribution of more granular real-time data about markets. International real estate companies, including JLL, have introduced technologies such as online marketplaces and property management tools, while also forcing competitive changes in local agent practices and regulations. Better digital mapping – often involving the use of drones – has also helped. The revelations of the Panama Papers in early 2016 have led to an increasing demand for real estate transparency. The fight against corruption is decisively on the international political agenda and, quite rightly, organizations like Transparency International are now putting the real estate sector under greater scrutiny. Governments play a vital part in this. India has made impressive public sector-led progress, driven by Prime Minister Narendra Modi’s aims of stimulating growth and reducing red tape. Laws have been enacted, ethical standards of agents raised, and land acquisition processes made fairer and more transparent. Government initiatives have also played a leading role in greater transparency coming to property markets in other Asian countries such as China and Japan. In particular they have also served to highlight and then close gaps between regulations and their enforcement. As JLL’s index shows, transparency is increasing in real estate markets even while the possibilities of the blockchain are being fully worked out. These changes are facilitating new investment and business activity but also, significantly, improving community well-being and advancing inclusiveness. It’s clear that technology will continue to be a key factor in driving transparency across many industries and for the real estate sector that is something to be embraced.